Looking back on this trip to Ireland, my time at Loughcrew was perhaps the most unexpected highlight. It was the last Neolithic site of our trip, the last of several ancient stone circles and similar sites, and yet by far the most impressive, even if just for its location. Panoramic view from my hike to Loughcrew. Loughcrew sits on the Slieve na Calliagh hills, the highest point in County Meath. The site originally included approximately 30 cairns with some estimates dating them back as early as 4,000 BC. Thus, it’s widely accepted the cairns are at least 5,000 years old. Two of the hills, Carbane East and Carbane West, hold the largest concentration of individual cairns. Of these, Cairn T and Cairn L are the most complete and, like Newgrange, are illuminated for short periods of time each calendar year. Cairn T aligns with the spring and autumn equinoxes (Ostara and Mabon, respectively), while Cairn L corresponds to sunrise on Samhain and Imbolc. The other cairns, now mainly visible as stone circles, are also believed to have corresponded with certain days, leading to the theory that the monuments were used to mark time rather than burry the dead. The illuminated back stone of Cairn T, spring equinox 2005. 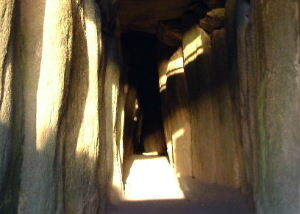 Image Credit: Knowth.com. Cairn T on Carbane East is open to the public and managed by the Irish Office of Public Works. However, Carbane West is situated on private land, making Cairn L inaccessible to most visitors. Unlike Carrowmore in Sligo or Newgrange fifty minutes to the east, Loughcrew boasts no visitor center. Travelers, instead, start their journey at the bottom of the hill in a nondescript parking lot. Or, like me, even farther down the hill at a small café I mistook for the visitor’s center at first glance. Ireland’s rains finally made their appearance as we reached the café, leading my mom to decide I should go to the site on my own. So after a quick word to get direction from the serving staff, I was off, hood thrown up to keep the rain from soaking me to the bone. A staircase cut into the hillside greeted me when I reached the site’s empty parking lot, quickly giving way to open pasture. The way to Cairn T is clearly marked – I merely followed the trail up the gentle slope. Before too long – definitely not the 45 minutes the serving staff had mentioned – I saw a small capstone come into view. No one had mentioned this smaller site in my previous research, so I was thoroughly confused. It felt too small to be the right site, but with the rain and wind buffeting me this way and that, I made up my mind to quickly take some pictures and head on back down. Quickly, I knelt and got out my camera, tucking it inside my raincoat so the casing wouldn’t soak and ruin. I had to run a dry cloth over the lens every few shots to keep the rain at bay all the same, but it gave me a chance to look around some more. Then I noticed the trail continued, turning sharp enough to the left that I hadn’t noticed at first. The dolmen was all I’d focused in on, nothing more. I couldn’t see where the trail led, as it disappeared near the top of another hill, steeper than the part I’d climbed so far. But with nothing to lose except a few more dry patches, I repositioned my camera bag and kept climbing. The rain eventually slacked then died away completely. As I looked out on the surrounding hills and valleys, all was veiled in beautiful hazy mist. And still the path led on. Looking back down the path. The structure in the distance is the capstone pictured above. Finally, a fence came into view, the gate unlocked. I couldn’t help but giggle and let out a small shout, certain I was still alone. Cairn T sprawled out before me, the remains of other cairns clearly visible near it. I wandered around the perimeter of the site for a while, simply looking on in awe before I approached the main cairn. One of the two government workers at the site noticed me then, and I followed him around Cairn T’s base to its entrance, where I met his coworker. She was busy pulling their information booklet and tickets out of the cairn – the rain had caught them off guard, and expecting everyone to turn around to wait the shower out they’d decided to store their equipment there. They seemed quite surprised when I showed up! We talked for a few minutes about the site and how my trip had gone thus far, then she asked if I wanted to go inside and handed me a flashlight. Looking up inside Cairn T.
I have a tendency towards claustrophobia, and am afraid of both the dark and being buried alive, so I didn’t stay inside the cairn for very long. But I’m definitely glad I did – the overwhelming sense of awe at the cairn’s existence and the mystery surrounding its purpose leave me with chills even now. After returning the flashlight, I wandered around the site a while longer, alone for the most part. I felt a sense of fulfillment, like a major chapter of our trip had come to a close. I’d only known of Newgrange’s illumination when I started the trip, but to see it repeated again and again across Ireland, from Listoghil at Carrowmore to Cairn T and Loughcrew… That’s something that will stick with me and fuel my novels onward. As I made my way back to the gate, I noticed other tourists had climbed the hill while I explored. The silent spell passed, and with one last look at the cairn, I made my way back to the car, ready for the next adventure. Admission to Cairn T is free. OPW employees are on site from 10:00 am to 6:00 pm daily during the summer months. However, it is possible to see the cairn during other parts of the year – simply visit the café at the bottom of the hill and ask for the key. You’ll need to leave your driver’s license as a deposit, but there is otherwise no fee. If you wish to see more of photos from Loughcrew, please check out my dA account here. The Book of Kells is perhaps one of the most well-known illuminated texts in the world. Completed in the 9th century, the Book contains all four gospels of the New Testament and is considered one of Ireland’s greatest treasures. Today, its 340 remaining folios are bound in four volumes displayed at Trinity College in Dublin. My family and I saw the Book while in Dublin on our 2011 vacation, but looking down at those illuminated pages only left me more curious and intrigued than before. Combine that with a film discovery after returning to the States – Tomm Moore’s The Secret of Kells – and I knew I had to see where they came from, before they were donated to Trinity in the mid 1600s. Saint Colmcille first settled at Kells in 550, but the group of monks credited with illuminating the Book didn’t arrive until 250 years later after fleeing their home on Iona due to Norse raiders. It’s believed the Book was created on Iona and the monks brought it with them, but scholars aren’t certain when its relocation occurred. With the original Book still safely kept at Trinity, perhaps one of the most noteworthy sights in Kells today is the 10th century round tower. Originally 90 feet tall, the tower served as a lookout and shelter for the monastery’s residence during attacks from raiders. But unlike other round towers of the time, which traditionally feature four lookout windows on the uppermost floor, Kell’s tower has five – one for each of the medieval city’s 5 gated entrances. St. Columcille’s house and 3 high crosses can also be found within the town. The Visitor Center houses additional exhibits, including replica pages from the Book of Kells, and is open from 10:00am to 5:30pm Monday thru Saturday during the summer months, and from 2:00pm to 6:00pm on Sundays. Admission is 4 euro per adult, and though the site is a heritage town, a Heritage Card doesn’t gain free admission. Guided tours of the monastic site can be arranged in advance for a fee, though visitors are also welcome to walk at their own pace and instead use a free audio tour available online. Admission to see the Book of Kells at Trinity College in Dublin, as well as walk through the college’s Old Library, is 11 euro per adult. The library is open from 9:00am to 6:00pm Monday thru Saturday, and from 9:30am to 6:00pm on Sundays during the summer months. 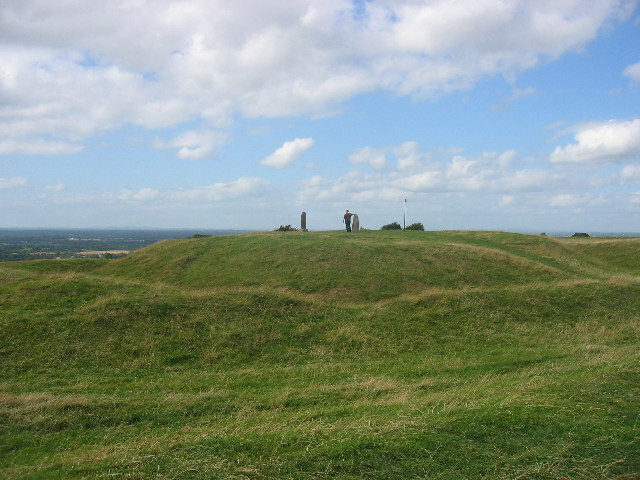 About 30 minutes away from Newgrange is the Hill of Tara, a site included in many Newgrange tours. Archeologists believe Tara’s significance predates Celtic times, with tombs from around 5,000 years ago. But Tara is perhaps most noteworthy for being the ancient seat of power in Ireland. It is here that 142 kings, chosen by their victories in battle rather than through family ties, were crowned and reigned. 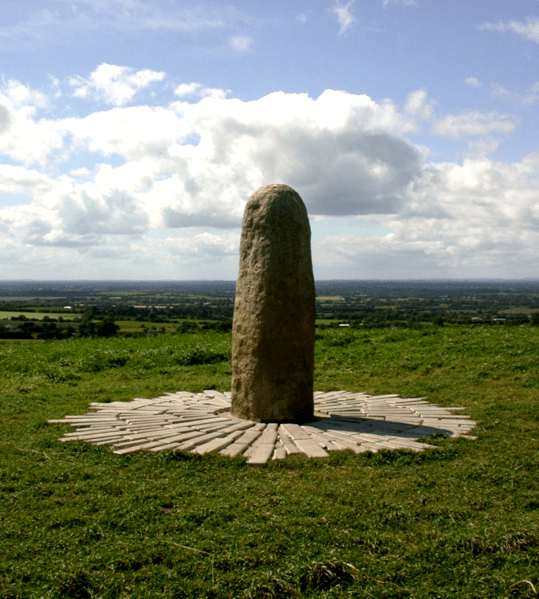 The Lia Fail, or Stone of Destiny, stands in the middle of the Royal Seat, and according to legend, this standing stone roared loud enough that the whole of Ireland would hear when a new king met a series of challenges placed before him. Tara was overall believed to be a sacred place, the entrance to the Otherworld and the dwelling of the ancient Irish gods. Perhaps it is no wonder, then, that legend has it St Patrick chose the nearby Hill of Slane in the 5th century on which to challenge the old pagan beliefs held firmly at Tara. His encounter with Tara’s High King Laoghaire was significant – with Laoghaire’s submission to St Patrick’s God, Ireland’s conversion to Christianity began. Today, Tara offers an expansive view of the surrounding landscape. It is listed as a Heritage Site, allowing Heritage Card owners free access; general admission is 3 euro per adult. Oftentimes, my love of Celtic music inspires me to research different physical places. On my first trip to Ireland in 2011, I spent a lot of time on the bus humming different tunes to myself as the bus moved on. It made the songs come alive, to see the places lyricists were writing about. So, it makes perfect sense to go to another place captured in song – Newgrange. Newgrange is located north of Dublin, in county Meath, and known as the most important Stone Age site in Europe. 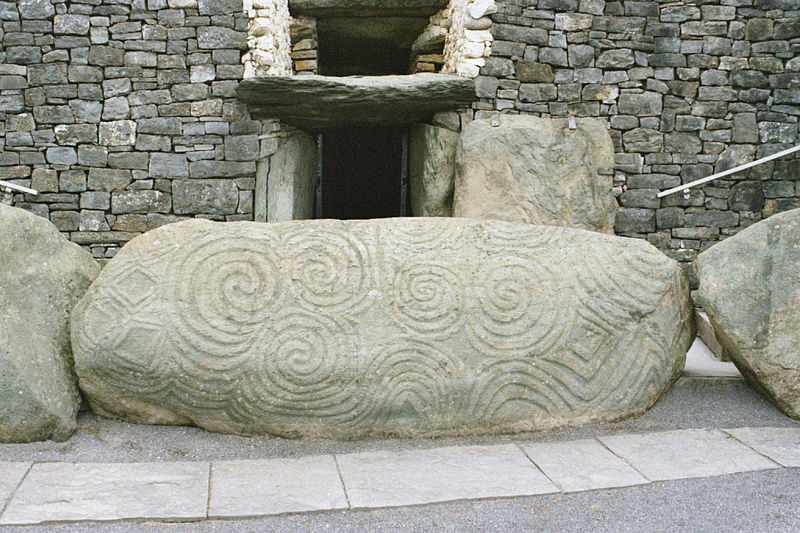 Constructed over 5,000 years ago, this monolithic passage tomb is older than both Stonehenge and the Great Pyramids, though now it is also recognized as having astrological, ceremonial, religious and spiritual connections. The mound is roughly 9 meters high and 104 in diameter, with stone slabs decorated in intricate spirals. On the morning of the winter solstice, the tunnel leading into the heart of the mound is lit by the rising sun. The light continues to enter farther and farther into the tunnel, until at last the inner chamber is lit. The event last for about 17 minutes, before the chamber is dark once more. Since admission to Newgrange is on a first come, first serve basis, I plan to take a day tour to see the site rather than try to go it on my own. One tour I see recommended fairly consistently is Mary Gibbon’s Newgrange and Hill of Tara tour. For 35 Euro per adult, she picks up tourists from various meeting places in Dublin and drives them to Newgrange, allowing people to enter the tomb without waiting in line for a ticket. The tour also includes a stop at the Hill of Tara and a drive through the town of Slane. However, upon reading reviews, some of which describing last minute cancellations or not being picked up at all, among other things, I fear I’m a bit concerned. I decided to look into a different tour through Gray Line, and found that it had much better reviews – the major complaint was that the air conditioning on the bus wasn’t functioning. 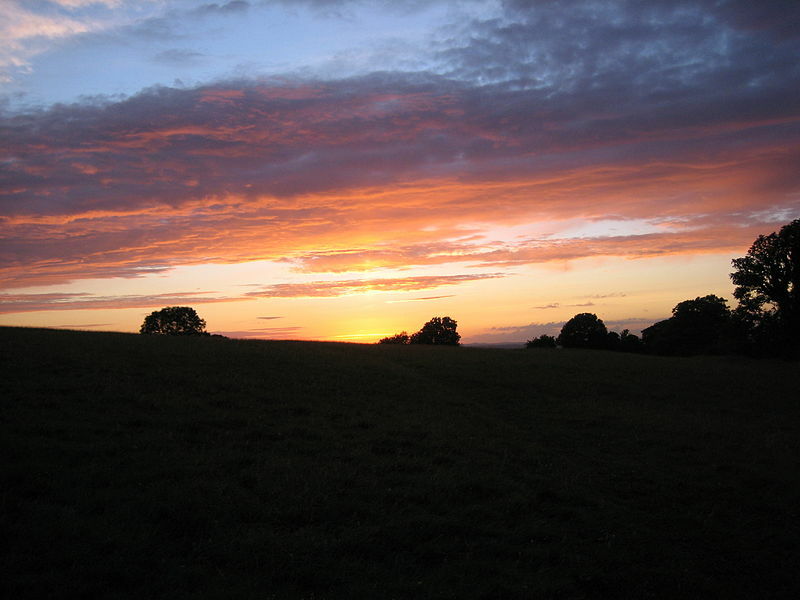 This tour goes to Newgrange and the Hill of Tara exactly like Mary’s tour, but it also travels to Howth, stopping to look out over Dublin Bay. The tour is also comparable price-wise: at $46 US dollars, it costs roughly 34 euro. However, if one would like to visit Newgrange without a tour group, the cost of admission is covered for Heritage Card holders.